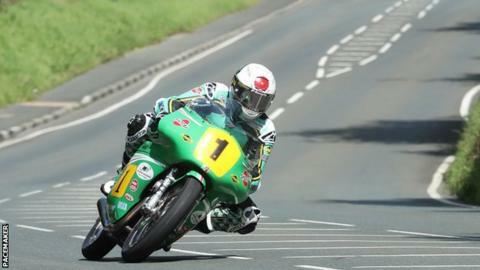 John McGuinness marked his return to the Isle of Man TT with victory in the Senior Classic TT race. The 46-year-old Englishman won onboard his Winfield Paton, finishing a minute 13.072 seconds ahead of Jamie Coward with Lee Johnston taking third place. McGuinness is making his TT comeback after breaking his back, leg and ribs in a crash at the 2017 North West 200. Having topped the practice times, he led from start to finish with a fastest time of 109.258mph. The veteran, who also won the four-lap Senior Classic in his last TT appearance in 2016, set a blistering opening loop to take control of the race and was able to keep clear of Johnston and England's Coward. Coward managed to avoid making a pit stop on his Ted Woof/Craven Manx Norton, which allowed him to take second spot. Irishman Johnston just held on to the third spot from Chris Swallow's Linsdell Enfield. County Fermanagh native Johnston made it to the top of the podium in the second big race of the afternoon, the Dunlop Lightweight Classic TT. Riding a Padgetts Racing Honda, Johnston overtook Ian Lougher's Laylaw Racing Yamaha on the opening lap and eventually managed to reel in the leader and fellow Northern Irishman Adam McLean for the Binch Racing Yamaha team at the end of the second before both riders took pit stops that left just a tenth of a second between them. Johnston pace took him 10 seconds clear of his rival on the third lap and he powered on to take the chequered flag with a last lap of 117.919mph as McLean finished almost 30 seconds further back with Lougher taking third place.